The quilting on the (No) Golden Shadows quilt is finally done… and I love how it came out! The rust red (Coat’s & Clark’s Paprika) looks perfect on top of the turquoise and I’m really starting to get the hang of the quilting foot on my machine. Which isn’t to say that the ovals are perfect- far from it! In fact, even though I was simply tracing the ovals from the backing of the quilt (which I lined up almost perfectly- YAY! ), my stitching still looks hand done. Actually, I should specify: hand done by me. Some people can make perfect stitches by hand. I can’t make even stitches by hand or machine, so when I say “by hand”, I mean more like the hand of a 5 year old. I rather like it that way. And now the binding dilemma. What do I bind this with? I know it will be machine stitched using my new binding clips. I was thinking of using the leftover material from the back for a binding, but I’m afraid the ovals will look all wonky. There is no material left over from the front. I’m thinking maybe a solid rust color, which will necessitate a trip to the fabric store. Should I pretend to be disappointed about that? In other news, Prowler the kitty got adopted and it was indeed hard to give him up. Even still, we will certainly be fostering more cats in the future. I bought a new set of pre-cuts: 2.5 inch mini charms. I got 11 packs of Moda’s Tucker Prairie by OneCanoeTwo. I’m pretty sure that these are going to become a Plus quilt. 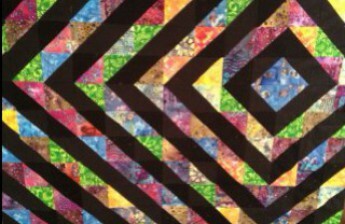 And finally, I’m contemplating joining a quilt guild here in South Florida. Does anyone my age (41) participate? Thoughts?